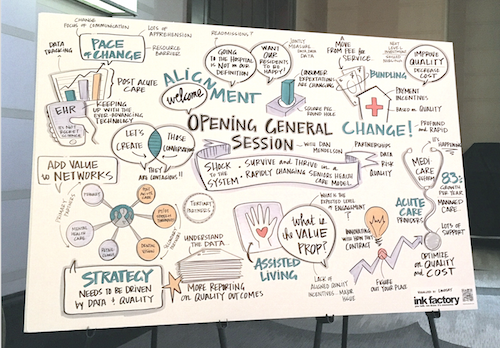 The NIC 2016 Spring Investment Forum closing session as interpreted by an artist. Senior living operators are taking several approaches to minimize payment and outcomes-related risk, participants in a panel discussion told National Investment Center for Seniors Housing & Care CEO Robert Kramer during the March 11 closing session of the group’s 2016 Spring Investment Forum. Kathryn Roberts, president and CEO of Shoreview, MN-based Ecumen, said that one of the ways her organization has reduced its risk over the past 13 years is by broadening its portfolio. In 2003, 98% of the organization’s revenue came from skilled nursing and government reimbursement, she said, adding that the percentage is down to 40% now. Lawrence Cohen, CEO and vice chairman of Dallas-based Capital Senior Living, said his company keeps risk low by focusing on private-pay senior living, owning its communities and aggressively measuring and controlling for outcomes. The company, which owns 126 communities with the capacity to serve 15,000 residents, has the highest percentage of owned properties in its portfolio of the top 50 senior living providers in the United States, he said, and more than 95% of the company’s revenues come from private-pay business. “We have no skilled nursing. We have no Medicare reimbursement. We don’t provide ancillary services directly through our company,” added Cohen, who also is chairman of the executive committee for the American Seniors Housing Association. Cohen said that although his organization will not assume financial risk, it does partner with providers that can offer health services to residents. Genesis provides therapy, rehabilitation and spas in almost half of the company’s communities, he said, and Genesis provides Capital with information that allows the company to measure outcomes. Capital Senior Living has incorporated quality assurance within the confines of the corporate governance committee of the board of directors, he added. Two years ago, Cohen said, the company hired clinical nurses, and it has developed quality assurance practices and procedures and a quality assurance committee. Each community has a medical director. Brenda Bacon, president and CEO of Mount Laurel, NJ-based Brandywine Senior Living, said that one of the ways her company keeps risk low is by focusing on hospitality services and partnering with other companies for other services. Brandywine, Bacon said, operates 27 communities and has two communities under construction, with construction on an additional community set to begin in the spring. When all of the communities are complete, the company will operate in seven states. Although the portfolio includes a 37-bed skilled nursing facility and a 62-unit independent living community, the company’s focus is assisted living and memory care, she said. Brandywine has partnerships with four hospital systems in New Jersey and Pennsylvania, Bacon said. When choosing partners for nonhospitality services, she added, providers must select partners that have the same views on quality, data and outcomes measurement. “If you’ve got that alignment of quality, you can make it work. But I think in some cases … we may be, some in the industry, rushing too hard because we think we’re going to miss the wave,” Bacon said. Quality, however, is directly correlated to margins and corporate success, she added. “The money that you invest in measuring and changing those things, not just to benchmark yourself against public data but to actually benchmark yourself against yourself … the more we focus on doing that, then the more we lower our risk in our business,” Bacon said. Bacon, who is the chairwoman of Argentum Board of Directors, said that some of the initiatives undertaken by that organization and others related to credentialing, certifications, community-level standards and related matters are important steps for the industry to take to reduce risk. Tom Coble, chairman of the board of governors for the American Health Care Association, touted the benefits of that organization’s LTC Trend Tracker, which the National Center of Assisted Living’s members can participate in as well. LTC Trend Tracker is a web-based tool that enables providers to benchmark personal metrics to those of their peers and to examine ongoing quality improvement efforts. From left: Robert Kramer, Kathryn Roberts, Lawrence Cohen, Brenda Bacon and Tom Coble participate in the NIC 2016 Spring Investment Forum closing session.